Film critic, producer, and presenter Mark Cousins' history shows how filmmakers are influenced both by the historical events of their times, and by each other. He demonstrates, for example, how Douglas Sirk's 1950s Hollywood melodramas influenced Rainer Werner Fassbinder's despairing visions of 1970s Germany and how George Lucas' Star Wars epics grew out of Akira Kurosawa's The Hidden Fortress. The Story of Film is divided into three main epochs: silent (1885–1928), sound (1928–1990), and digital (1990-present), and within this structure films are discussed in chapters reflecting both the stylistic concerns of the filmmakers and the political and social themes of the time. As well as covering the great American films and filmmakers, the book explores cinema in Europe, Africa, Asia, Australasia, and South America, and shows how cinematic ideas and techniques cross national boundaries. Avoiding jargon and obscure critical theory, the author constantly places himself in the role of the moviegoer watching a film, asking How does a scene or a story affect us, and why? In doing so, he gets to the heart of cinematic technique, explaining how filmmakers use lighting, framing, focal length, and editing to create their effects. Clearly written, and illustrated with more than 400 stills, this book is essential reading for both film students and the general moviegoer. 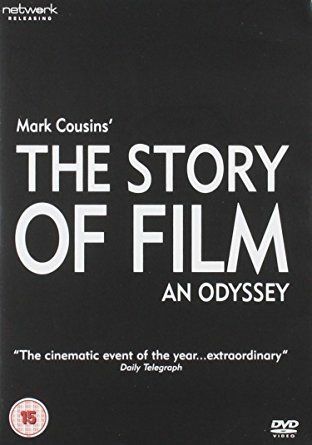 "The director and narrator, Mark Cousins, a film critic from Northern Ireland (and author of a 2004 book also called “The Story of Film”), aims for comprehensiveness and coherence. He wants to tell the whole story, from Genesis to Revelation, as the saying goes, but he also wants this vast chronicle to have a shape and a point: themes and patterns amid the names, places and images. He succeeds to an impressive extent. The results of his dogged research, compulsive travel and hard thinking are exemplary, useful and sometimes thrilling. He is not the first to attempt to frame a master narrative of cinema using the tools of the medium itself. An important precursor (and also, perhaps, an implicit interlocutor) is Jean-Luc Godard’s “Histoire(s) du Cinéma,” which recently became available in the United States on DVD. Mr. Godard’s version, like most of his later films, is personal, polemical and sometimes cryptic; he turns the story (or stories) into a splintered modernist epic. Mr. Cousins works in prose, synthesizing, analyzing and clarifying. This is a semester-long film studies survey course compressed into 15 brisk, sometimes contentious hours." "...visually ensnaring and intellectually lithe, it’s at once a love letter to cinema, an unmissable masterclass, and a radical rewriting of movie history."